Population of Kazakhstan (in millions) from 1950–2009. The demographics of Kazakhstan enumerate the demographic features of the population of Kazakhstan, including population growth, population density, ethnicity, education level, health, economic status, religious affiliations, and other aspects of the population. Some use the word Kazakh to refer to the Kazakh ethnic group and language (autochthonous to Kazakhstan as well as parts of Russia, China and Mongolia) and Kazakhstani to refer to Kazakhstan and its citizens regardless of ethnicity, but it is common to use Kazakh in both senses. Official estimates put the population of Kazakhstan at 18,137,300 as of December 2017, of which 44% is rural and 56% urban population. The 2009 population estimate is 6.8% higher than the population reported in the last census from January 1999 (slightly less than 15 million). These estimates have been confirmed by the 2009 population census, and this means that the decline in population that began after 1989 has been arrested and reversed. The proportion of men makes up 48.3%, the proportion of women 51.7%. The proportion of Kazakhs makes up 63.6%, Russians 23.7%, Uzbeks 2.9%, Ukrainians 2.1%, Uygur 1.4%, Tatars 1.3%, Germans 1.1%, others 3.9%. Note that a large percentage of the population are of mixed ethnicity. The first census in Kazakhstan was conducted under Russian Imperial rule in 1897, which estimated population at round 4 million people. Following censuses showed a growth until 1939, where numbers showed a decrease to 6,081 thousand relative to the previous census done 13 years earlier, due to famines of 1922 and 1933. But since 1939 population has steadily increased to 16.5 million in the 1989, according to corresponding year census. Official estimates indicate that the population continued to increase after 1989, peaking out at 17 million in 1993 and then declining to 15 million in the 1999 census. The downward trend continued through 2002, when the estimated population bottomed out at 14.9 million, and then resumed its growth. Significant numbers of Russians returned to Russia. Kazakhstan underwent significant urbanization during the first 50 years of the Soviet era, as the share of rural population declined from more than 90% in the 1920s to less than 50% since the 1970s. Data sources: Population 1897 from Russian Empire Census. Population 1926 from First All-Union Census of the Soviet Union. Population 1939–1999 from demoscope.ru, 2002–2008 from Kazakhstan Statistical Agency web site. Rural/urban shares 1939–1993 from statistical yearbooks, print editions, 2002–2008 from Kazakhstan Statistical Agency web site. 2009–2014 from Kazakhstan Statistical Agency web site. 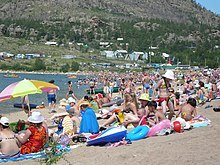 As of 2003, there were discrepancies between Western sources regarding the population of Kazakhstan. United States government sources, including the CIA World Fact Book and the US Census Bureau International Data Base, listed the population as 15,340,533, while the World Bank gave a 2002 estimate of 14,858,948. This discrepancy was presumably due to difficulties in measurement caused by the large migratory population in Kazakhstan, emigration, and low population density - only about 5.5 persons per km² in an area the size of Western Europe. 1 Births and deaths until 1979 are estimates. Total fertility rate by regions of Kazakhstan: Mangystau - 3.80, South Kazakhstan - 3.71, Kyzylorda - 3.42, Atyrau - 3.29, Jambyl - 3.20, Aqtobe - 2.70, Almaty (province) - 2.65, Almaty (city) - 2.65, City of Astana - 2.44, West Kazakhstan - 2.29, Aqmola - 2.19, East Kazakhstan - 2.07, Qaragandy - 2.04, Pavlodar - 1.98, North Kazakhstan - 1.72, Qostanay - 1.70, Republic of Kazakhstan - 2.65. Thus it can be seen that fertility rate is higher in more traditionalist and religious south and west, and lower in the north and east, where the percentage of Slavic and German population is still relatively high. According to the Kazakhstan Demographic and Health Survey in 1999, the TFR for Kazakhs was 2.5 and that for Russians was 1.38. TFR in 1989 for Kazakhs & Russians were 3.58 and 2.24 respectively. Kazakhstan demographics 1897-1970. Major ethnic groups. Famines of 1920s and 1930s are marked with shades. Kazakhstan's dominant ethnic group Kazakhs, traces its origin to 15th century, when a number of Turkic and some Mongol tribes united to establish the Kazakh Khanate. With cohesive culture and national identity, they constituted absolute majority on the land until Russian colonization. Russian advancement into the territory of Kazakhstan began in the late 18th century, when the Kazakhs nominally accepted Russian rule in exchange for protection against repeated attacks by the western Mongolian Kalmyks. In the 1890s, Russian peasants began to settle the fertile lands of northern Kazakhstan, causing many Kazakhs to move eastwards into Chinese territory in search of new grazing grounds. The 1906 completion of the Trans-Aral Railway between Orenburg and Tashkent further facilitated Russian colonization. The first collectivized farms opened in Kazakhstan in 1921, populated primarily by Russians and Soviet deportees. In 1930, as part of the first Five Year Plan, the Kazakh Central Committee decreed the sedentarization of nomads and their incorporation into collectivized farms. This movement resulted in devastating famine, claiming the lives of an estimated 40% of ethnic Kazakhs (1.5 million), between 1930-33. Hundreds of thousands also fled to China, Iran and Afghanistan. The famine rendered Kazakhs a minority within Kazakhstan, and only after the republic gained independence in 1991 did Kazakhs recover a slim demographic majority within Kazakhstan. Demographics would continue to shift in the 1950-1960s, wherein as part of Nikita Khrushchev's Virgin Lands Campaign, hundreds of thousands of Soviet deportees were relocated to the Kazakh steppes in order to farm. As recognized in the 1959 census, the Kazaks became a minority for the first time in history, comprising just 30% of the total population of Kazakhstan. Russians numbered 42.7%. According to the 2009 census, the ethnic composition of Kazakhstan is approximately: 63.1% Kazakh, 23.7% Russian, 2.9% Uzbek, 2.1% Ukrainian, 1.4% Uyghur, 1.3% Tatar, 1.1% German, 1% Kyrgyz, and <1% Korean, Turkish, Azerbaijani, Belarusian, Dungan, Kurdish, Tajik, Polish, Chechen. ^ "Ministry of National Economy of the Republic of Kazakhstan, Committee on statistics: Main socio-economic indicators". ^ Schreiber, Dagmar and Tredinnick, Jeremy. Kazakhstan. Odyssey Publications, 2010, p. 82. ^ "Kazakhstan". U.S. Department of State. Retrieved 18 March 2015. ^ UK Foreign and Commonwealth Office, Kazakhstan, 2 Feb 2011 Archived 6 October 2011 at the Wayback Machine. ^ "News & featured articles". Retrieved 18 March 2015. ^ Ambassador Erlan A Idissov, Embassy of the Republic of Kazakhstan to the USA. ^ "World DataBank>World Development Indicators". databank.worldbank.org. Retrieved 31 January 2017. ^ "Халық". Retrieved 18 March 2015. ^ Естественное движение населения республик СССР, 1935 [Natural population growth of the Republics of the USSR, 1935] (in Russian). Demoscope.ru. Archived from the original on 2 April 2015. Retrieved 31 March 2015. ^ "О демографической ситуации в Республике Казахстан". www.stat.gov.kz. ^ Spoorenberg, Thomas (2013). "Fertility changes in Central Asia since 1980". Asian Population Studies. 9 (1): 50–77. doi:10.1080/17441730.2012.752238. ^ Spoorenberg, Thomas (2015). "Explaining recent fertility increase in Central Asia". Asian Population Studies. 11 (2): 115–133. doi:10.1080/17441730.2015.1027275. ^ "Kazakhstan: Demographic and Health Survey, 1999 - Final Report, Chapter 4: Fertility" (PDF). ^ a b Olcott, M. B. (1995). The Kazakhs. Stanford, California: Stanford University Press. ^ Pierce, A. R. (1960) Russian Central Asia, 1867-1917: A study in colonial rule. Berkeley: University of California Press. ^ Zardykhan, Z. (2004). Russians in Kazakhstan and demographic change: Imperial legacy and the Kazakh way of nation building. Asian Ethnicity, 5(1), 61–79. ^ "Äåìîñêîï Weekly - Ïðèëîæåíèå. Ñïðàâî÷íèê ñòàòèñòè÷åñêèõ ïîêàçàòåëåé". Archived from the original on 21 March 2016. Retrieved 18 March 2015. ^ "Äåìîñêîï Weekly - Ïðèëîæåíèå. Ñïðàâî÷íèê ñòàòèñòè÷åñêèõ ïîêàçàòåëåé". Retrieved 18 March 2015. ^ "Äåìîñêîï Weekly - Ïðèëîæåíèå. Ñïðàâî÷íèê ñòàòèñòè÷åñêèõ ïîêàçàòåëåé". Archived from the original on 16 March 2010. Retrieved 18 March 2015. ^ "Äåìîñêîï Weekly - Ïðèëîæåíèå. Ñïðàâî÷íèê ñòàòèñòè÷åñêèõ ïîêàçàòåëåé". Archived from the original on 3 December 2009. Retrieved 18 March 2015. ^ "Äåìîñêîï Weekly - Ïðèëîæåíèå. Ñïðàâî÷íèê ñòàòèñòè÷åñêèõ ïîêàçàòåëåé". Archived from the original on 24 March 2010. Retrieved 18 March 2015. ^ "2014 жылғы мұрағат". www.stat.gov.kz. ^ "Central Asia:: KAZAKHSTAN". CIA The World Factbook. Rasuly-Paleczek, Gabriele; Katschnig, Julia (2005), Central Asia on Display: Proceedings of the VIIth Conference of the European Society for Central Asian Studies, LIT Verlag Münster, ISBN 978-3-8258-8309-6 . For current data, use these sites. This page was last edited on 23 February 2019, at 12:09 (UTC).